Film makers Jelte Keur and Reinout van Schie say they were waiting 10 months for the perfect weather conditions to take this stunning footage of Utrecht’s Dom tower. 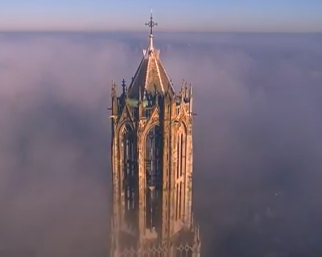 The resulting film of the city’s cathedral tower surrounded in mist was taken earlier in November using a drone. The Dom is the tallest church spire in the Netherlands at 112.5 metres and was built between 1321 and 1382. The cathedral itself was never completed and collapsed in 1674, leaving the tower as a separate structure.